The UFC finally returns this weekend with an entertaining UFC Fight Night 138 event taking place in Moncton, New Brunswick, Canada. The fight card is set for Saturday, October 27, and will feature on FOX and UFC Fight Pass. We’ve uncovered six prime betting opportunities throughout the main card and will share our reasoning for every pick with you below. The super hard-hitting Volkan Oezdemir is set for battle against the rising light heavyweight contender, Anthony Smith. These two guys have experienced much the same trajectory in the division so far, having both ascending through the ranks with lightning-fast speed. Oezdemir worked his way past Ovince Saint Preux to then go on and dominate Jimi Manuwa and Misha Cirkunov inside the first 30 seconds. His power looked to be unbelievable, and it was only a matter of time until the UFC called on him to compete against Daniel Cormier for the UFC Light Heavyweight Championship. It proved to be too much, too soon for Oezdemir, and the top-ranked pound-for-pound fighter defeated him inside two rounds. However, don’t be fooled into thinking that Oezdemir is a pushover, because he’s not. Smith is a dangerous Muay Thai fighter and arguably looks like the better striker than Oezdemir, but he lacks defensively. Anthony Smith will need to respect Volkan’s power and blistering pace early in this fight. Despite his tendency to be involved in back-and-forth wars with an opponent, that’s precisely not the type of fight Smith will be wanting against Oezdemir. He’ll likely prefer to utilize his best techniques; such as excellent clinch strikes and long, rangy punches and kicks, and avoid exchanging punch-for-punch with Oezdemir. We’re betting on Volkan’s knockout power to get him over the line in this main event. Smith gets hit a little too often, and that’s not the type of trait we want from someone who is standing across from Oezdemir. The fighter who fans mock as the “Greatest of All Time,” Conor McGregor’s training partner, Artem Lobov, finds himself in an exciting co-main event clash with Michael Johnson in Moncton this weekend. Michael Johnson has looked impressive since moving down to featherweight, although the results don’t necessarily reflect the work he has done so far. Johnson has incredibly fast hands and is excellent at positioning himself just out of an opponent’s range before sliding back into range and hammering home a combination of his own. Johnson’s punches aren’t just touching an opponent; they’re landing with full force as seemingly every one of them is thrown with vicious intentions. While we’re yet to see him score another knockout much like the one he had against Dustin Poirier at lightweight, he’s still certainly capable of finishing a fight inside a matter of minutes. Lobov will truly be tested in this matchup with Johnson. At a significant reach disadvantage, Lobov will be looking for ways to close the distance and connect his strikes. Lately, Lobov has been happy playing the role of a counter striker and this might work favorably against Johnson if he can lure him in and land a devastating punch or two. The problem is that many of Lobov’s punches don’t have the type of power that can finish a guy like Johnson. Johnson is a wide favorite, but there are excellent odds if you take Johnson to win inside the distance. Now 1-3 in the UFC, Andre Soukhamthath will have the best chance possible to regain some momentum against late-notice opponent Jonathan Martinez. Martinez will be making his UFC debut at UFC Fight Night 138. Martinez is a young and crafty fighter with what seems to be superb submission ability. While standing, he’s particularly dangerous as well and has remarkably powerful kicks. In particular, he likes to work the lead leg of an opponent with these damaging kicks. It’s on the mat where he looks to be possibly more dangerous. Much like the super-elusive and submission happy Tony Ferguson, Martinez shifts his body around to create new angles and create an opportunity for a submission. Whether it’s an armbar or a triangle choke, Martinez has locked up multiple submissions throughout his professional career so far. This is where Soukhamthath will need to be careful, especially because Martinez’s poor balance and below average takedown defense see him on the mat more often than the average fighter. But despite Martinez’s range and an arsenal of strikes, Soukhamthath should have the advantage for as long as this one stays standing. A composed and focused approach from “The Asian Sensation” will see him land his punches at will. Once regarded as one of the most fascinating prospects of the light heavyweight division, Misha Cirkunov is now booked in what could be an absolute war with Patrick Cummins. Where there’s Patrick Cummins, there’s blood – lots of it. Cummins takes ridiculous levels of damage every single time he steps into the UFC’s octagon but still manages to grind out a victory here and there. This happened twice against Jan Blachowicz and Gian Villante in recent memory. After being crushed in the first round and seemingly being on the verge of being knocked out, Cummins somehow recovered and made it to the stool at the end of round one. From there, he did just enough to secure rounds two and three and win the decision. Of course, this didn’t happen against Corey Anderson, who just completely ragdolled him for three rounds. Cummins tendency to stick around longer than usual is a desired attribute in a fighter, but it is only highlighted because he gets tagged way too frequently. Expect Misha Cirkunov to land his shots early and often. If he does, he might be able to get Cummins out of there early – and that’s a maybe worth betting on. Two light heavyweight fighters who are known to fatigue greatly after the first round are set to do battle in what realistically would be preferable as a five-minute fight. Despite his incredible power and decent athleticism, Gian Villante has a bad, bad tendency of tiring through the middle and late stages of a fight. He did this against Patrick Cummins and gave away rounds two and three on the basis that he was physically unable to throw with the same conviction he had at the beginning. However, don’t let that distract you from his tremendous stopping power. If Villante can connect with his strikes in the first round, it’s likely Herman will go down. Herman will undoubtedly be looking to get this fight to the mat. He might not be able to use his wrestling skills to move the physically stronger and larger opponent around in the first round, but if they make it into the second and third, this could very well be a Herman on top kind of fight. Although, the most realistic outcome for this fight is Villante crushing Herman and standing over him while the fight is called off. Alex Garcia and Court McGee will get the main card started with what should be an exciting welterweight clash between two crafty fighters. Alex Garcia is in desperate need of some consistency inside the UFC’s octagon. Alternating wins and losses during his eight contests, Garcia has shown an inability to secure a decision victory in the last couple of years. Of course, he’s more than capable of finishing a fight either via submission or KO/TKO, but we just haven’t seen the consistency that is needed. Look up Court McGee highlights, and you’ll likely see clips from his work from 2011-2013. Back then, he was regarded as a monster and even managed to score a victory against current UFC middleweight champion, Robert Whittaker. He’s still a dangerous fighter, especially when considering his blistering pace and high volume of strikes. This fight comes down to whether Garcia can finish McGee inside the distance, as McGee’s high volume of significant strikes landed will likely be enough to win a convincing decision if it makes it that far. UFC Fight Night 138 begins on UFC Fight Pass from 6:30 pm ET (10:30 pm GMT) on Saturday, October 27. 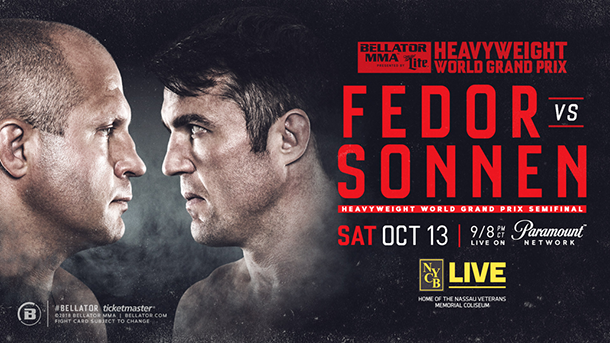 Bellator 208, the second of two big-time Bellator events taking place this weekend, will see Fedor Emelianenko and Chael Sonnen battle it out to advance in the Bellator World Heavyweight Grand Prix. Scheduled for Saturday, October 13, just one day after Matt Mitrione and Ryan Bader headline Bellator 207, Bellator 208 will also feature several brilliant fights between established talent in the promotion. Fedor Emelianenko and Chael Sonnen are going to compete in a heavyweight bout in Bellator in 2018. It sounds ridiculous, and it kind of is, but there’s a lot to love about this matchup. Emelianenko advanced to the second round after defeating finishing Frank Mir inside the first minute of his first-round matchup, and Sonnen made his way to the semifinals by outworking Quinton Jackson through three rounds. Let’s begin by saying that it seems like whenever you back against one of these two fighters, they go on to win the bout with ease. It happened to many bettors who picked Quinton Jackson to be too big and strong for Sonnen in the first round, and many people though Mir would be too much for Fedor. Yet, here we are. Fedor’s legacy lives on as not just the greatest heavyweight to ever compete in mixed martial arts but arguably one of the best mixed martial artists of any weight class in the history of the sport. Gone are the days of his ridiculous 29-fight winning streak, but Fedor is still an incredibly dangerous fighter with crafty fighting ability on the feet and on the mat, too. Moreover, then there’s Chael Sonnen, whose athletic ability might not be what it once was, but his intelligence and understanding of the fight game is still as good as ever. After losing to Tito Ortiz in his Bellator debut, he went on to defeat Wanderlei Silva and Quinton Jackson via unanimous decision. Pace and pressure is the key for Chael Sonnen in this matchup. He’ll need to avoid trading shots with the super-powerful Fedor Emelianenko, but if he can get this fight to the mat and control the flow of the fight with his excellent top pressure, he might do enough to win on the scorecards. Sonnen makes for a great underdog bet. Benson Henderson is on the last fight of his Bellator contract and will be looking to end his current run by making a statement in front of the fans at Bellator 208. Henderson will face Saad Awad, who is on an impressive four-fight winning streak. Long-time fans of mixed martial arts remember Benson Henderson as a wrecking ball who has beaten the likes of Frankie Edgar, Donald Cerrone, Nate Diaz, Jorge Masvidal, and many other top lightweights in the UFC. Since moving to Bellator, we haven’t seen the Henderson of old, and he has overwhelmingly struggled to get consistent results. Recently, however, Henderson did snap a losing streak and returned to winning ways. As mentioned earlier, Saad Awad’s four-fight winning streak is exactly the type of momentum that Henderson is in desperate need of. Awad’s heavy punches and fight-finishing power has helped him secure victories after losing to some of the top contenders in Bellator’s lightweight division. Benson Henderson should be too good for Saad Awad in this fight. Awad is dangerous, but is a little too vulnerable to strikes and Henderson should make him pay at close and long range. Alexander Shlemenko will return to Bellator again to face Anatoly Tokov, who is flying under the radar despite winning 19 of his last 20 fights. A former champion of Bellator, Shlemenko is arguably on the worst stretch of his career. It’s only two consecutive defeats, so it might not seem like much, but he dropped a fight recently that was he expected to win against Bruno Silva at M-1 Challenge. That defeat made it two in a row for Shlemenko who last lost to Gegard Mousasi in the Bellator cage. It’s not going to be easy for Shlemenko to snap this streak, either, as he’ll be facing Anatoly Tokov who has likely forgotten the feeling of losing. Tokov joined Bellator in February 2017 and won his debut with the promotion but was forced to sit out after tearing his ACL. He returned to the cage in a big way by defeating Vladimir Filipovic via submission in less than one minute at Bellator 200.
Who could honestly confidently back Alexander Shlemenko after what we saw from him at M-1 Challenge in his last fight? He looked disinterested, and his power wasn’t there. Tokov will be ready for Shlemenko’s tricky spinning attacks and eventually take over the contest. Cheick Kongo will test Timothy Johnson in his first fight with Bellator after his back-and-forth seven-fight stint with the UFC. Cheick Kongo has won all of his last six fights (!!!) and is now on the best run of his entire mixed martial arts career. As always, we never really know what version of Kongo we are going to get on fight night, but he has managed to outlast so many of Bellator’s heavyweight fighters in a row. This will be a different test, though, considering that Timothy Johnson is a decent fighter who is crossing over from the UFC. While competing with the UFC, Johnson managed several major victories – including one over Marcin Tybura – but was never able to string two wins together. The odds for this fight have been all over the place. Some bettors picked up Timothy Johnson at generous underdog odds, but those days have been and gone. Kongo is now a moderate underdog and will make for an excellent bet here at Bellator 208. Henry Corrales and Andy Main will get the Bellator 208’s main card started. Things change quickly in mixed martial arts, and there is arguably no greater evidence of that than the way that Henry Corrales has turned his Bellator career around. After losing his first three fights with the promotion, Corrales has since picked up three major victories. He’ll be facing Andy Main, who is mostly known for his appearance on The Ultimate Fighter Season 12. Since then, however, he’s crafted a stable career as a mixed martial artist and will now enter Bellator after winning eight of his last nine fights. This is Corrales’ opportunity to shine against a Bellator newcomer. Look for Corrales to keep his streak alive. The Bellator 208 main card begins on Paramount Network from 9:00 pm ET (1:00 am GMT) on Saturday, October 13. There’s no time to rest for fans of mixed martial arts. Just days after the most significant event in UFC history that saw Khabib Nurmagomedov defeat Conor McGregor (and an intense post-fight brawl), Bellator will be hosting not one but two epic events. Bellator 207 is the first of the two and will take place at the Mohegan Sun Arena in Uncasville, Connecticut on Friday, October 12. The Bellator World Heavyweight Grand Prix continues this weekend when Matt Mitrione meets Ryan Bader in the first semifinal of the major tournament. Mitrione advanced to the second round after defeating Roy Nelson by majority decision, and Bader made his way here after knocking out “King Mo” in less than 20 seconds. Matt Mitrione could have (and arguably should have) been Bellator’s heavyweight champion already if it wasn’t for the grand prix. Mitrione has looked outstanding since transitioning to Bellator and remains undefeated in the promotion after four fights. While his biggest win was his knockout victory over Fedor Emelianenko on the grand stage of Bellator NYC last year, some of his best work was against Roy Nelson at Bellator 194 in the first round of this tournament. Despite a narrow decision and being dominated by Nelson for minutes at a time, Mitrione’s stand-up looked better than ever, and he was piecing up the veteran with stiff straight punches, excellent body shots, and heavy leg kicks. Ultimately, his work while standing was enough to win over two of the three judges. Ryan Bader has also looked exceptional since joining the ranks at Bellator, and it’s difficult to decipher whether it’s because he has improved dramatically or only because he is facing lesser-skilled competition – it’s likely a combination of both. Since leaving the UFC, Bader has defeated Phil Davis, Linton Vassell, and Muhammad Lawal, and now reigns as the light heavyweight champion of the promotion. If he goes on to win the tournament, he’ll also become the first-ever simultaneous two-division champion in Bellator. Bader’s wrestling is the X-factor in this matchup, and there’s no doubting the significance of his advantage in this department. Mitrione was continually grounded by Nelson in his last fight and was beaten so severely on the mat in round three that one judge awarded Nelson with a 10-8 in the final round. Of course, Mitrione’s striking is as dangerous as ever, but it’s too hard to pick against Bader and his grappling in this main event. Roy Nelson’s levels of frustration couldn’t be any higher. After losing what he believes is a controversial decision against Matt Mitrione in the first round of the Bellator World Heavyweight Grand Prix, he’ll now compete in the co-main event while Mitrione has the chance to advance in the tournament. Nelson will face the returning Sergei Kharitonov, who has compiled an impressive four-fight winning streak since losing to Javy Ayala in November 2016. You never really know what you’re going to get from Roy Nelson. At the age of 42, we’ve almost seen it all from “Big Country,” but he’s managed to drop several incredibly important fights in recent years. Nelson’s greatest problem seems to be a vast discrepancy in the way that he scores a fight compared to the way the actual judges score the bout. Against Mitrione, Nelson secured critical takedowns in round one and two but did little work from the dominant position and therefore was unable to steal the rounds. Of course, this problem is quickly forgotten when he lands one of his super-powerful punches and finishes the fight via knockout. Sergei Kharitonov’s Bellator debut couldn’t have gone any worse than it did. After managing an impressive five-fight winning streak, Kharitonov was knocked out by Javy Ayal in only 16 seconds at Bellator 163. Despite bouncing back with a win over Chase Gormley not long after, Kharitonov has since competed in China and Russia and again worked his way into another winning streak of four. Nelson lost to Mitrione solely because he was outmatched on the feet. He won’t be out of his league in this one. Lorenz Larkin has been asked to deal with yet another opponent change for Bellator 207. Larkin was initially scheduled to fight Yaroslav Amosov, but an injury forced Amosov to withdraw and Erick Silva to step in. However, Silva also became injured recently, and it is now Ion Pascu who will meet Lorenz Larkin at Bellator 207 this weekend. When Lorenz Larkin made his way to Bellator, many thought he would be in the running for a title. However, Larkin went on to lose fights with top Bellator talent in Douglas Lima and Paul Daley and now finds himself needing to reclimb the ranks. Larkin will be up against Pascu, who has appeared only once inside the Bellator cage. In his debut with the promotion, he lasted the distance with Ed Ruth and now will secure his first victory with the organization. It won’t be easy, but Lorenz Larkin’s class will shine through at Bellator 207. Kevin Ferguson Jr. will move down to the lightweight division as he looks to make a name for himself in the 155 lbs category. “Baby Slice” will be competing against Corey Browning on the main card of Bellator 207. Kevin Ferguson has bounced back in a big way since losing his mixed martial arts debut. “Baby Slice” was submitted by a guillotine choke in his first-ever fight but has since backed it up with three wins all by way of first-round stoppage. He’ll enter this fight after defeating Devon Brock in only 34 seconds. Browning will be making his Bellator debut this weekend and is primed with a brilliant opportunity to snap a two-fight losing streak and score a significant victory on the biggest stage of his career so far. After starting his career with three stoppages, Browning has since lost touch and been unable to secure a victory. Don’t be fooled into comparing “Baby Slice” with the street fighting of his father, Ferguson Jr. is becoming increasingly technical and well-rounded as a mixed martial artist. Look for a finish here. Two incredibly exciting prospects will do battle at the beginning of Bellator 207’s main card when Carrington Banks meets Mandel Nallo in a lightweight bout. Banks started his career with seven consecutive victories and looked to be nearly unstoppable until meeting Adam Piccolotti recently. Upon entering the Piccolotti fight, Banks was a heavy betting favorite but ended up giving his back to the submission-wiz and losing the fight in the third round. Nallo is flying under the radar a little since joining Bellator even after securing an impressive 18-second head kick knockout in his debut with the promotion. With a big win over Banks on the Bellator 207 main card, Nallo is well on his way to becoming a highly-regarded prospect – if he isn’t already! We’re taking all of the favorites here. The Bellator 207 main card begins on Paramount Network from 9:00 pm ET (1:00 am GMT) on Friday, October 12. It’s finally here. Khabib Nurmagomedov will defend his UFC Lightweight Championship against Conor McGregor in the main event of UFC 229 this weekend at T-Mobile Arena in Las Vegas. This bout is not just the most anticipated of the evening; it’s also one of the greatest matchups ever put together by the UFC. Nurmagomedov and McGregor will headline a relatively stacked main card that features several epic clashes between ranked UFC contenders. We’re here to bring you all of the odds and our analysis. It’s been almost two years since we have seen Conor McGregor compete inside the UFC’s Octagon, and when he returns this weekend, he’ll be up against his toughest test to date. Standing across from him is the undefeated Russian lightweight, Khabib Nurmagomedov, who has stormed past 26 opponents and never looked in trouble while doing so. However, as much as this is a difficult task for “The Notorious,” it’s also a big ask for Nurmagomedov, who is yet to face a striker of McGregor’s caliber – partly because McGregor is arguably the best striker in the UFC. Khabib’s pathway to victory in this matchup is no secret; he’ll look to secure takedown after takedown and maul McGregor on the mat with vicious ground and pound. Although his gameplan never changes, no one has been able to stop the onslaught of takedowns from Nurmagomedov to date. Nurmagomedov’s takedowns come as a result of overwhelming forward pressure that forces his opponent back to the cage. Edson Barboza’s terrifying kicks were no match for Nurmagomedov because the Russian continually pushed him backward and disallowed him from planting his feet. It could be a different story against McGregor, however. The Irishman is a master of pressure, as well. Although he doesn’t storm forward in the same way that Nurmagomedov does, McGregor controls the center of the Octagon due to his reach, reflexes, timing, and feints. If Nurmagomedov can’t move McGregor from the center, the Russian will have an increasingly challenging time getting McGregor to the mat. Moreover, as long as this fight is standing, it’s in favor of Conor McGregor. Tony Ferguson is back, and he wants to make a statement. “El Cucuy” was stripped of his UFC Interim Lightweight Championship after an unfortunate injury caused him to withdraw from his main event title fight against Khabib Nurmagomedov in April this year. Now motivated to earn himself a shot at the winner of Nurmagomedov vs. McGregor, Ferguson is set on defeating Anthony Pettis at UFC 229. Pettis’ last performance against Michael Chiesa was enough to make everyone assume he has returned to the form of his past. However, Pettis has always been a fantastic fighter, and his submission win over Chiesa shouldn’t have come as a surprise to anyone. Pettis is remarkably skilled on the mat and has picked up several major submission victories over elite grapplers in recent years alone. Moreover, on the feet, of course, Pettis’ outstanding arsenal of kicks and counter punches means that he is still as dangerous as ever. When these two forces collide at UFC 229, it’s tough to see a scenario in which they both leave the cage unscathed. Alexander Volkov was arguably already deserving of a shot at the UFC Heavyweight Championship, but he’ll now need to get through the heavy-hitting Derrick Lewis to get that opportunity. Lewis will step into the cage after his fight with Francis Ngannou at UFC 226 that was memorable for all of the wrong reasons. A miserable total of 31 strikes were landed by both fighters through 15 minutes of “action” and led many to wonder what went wrong. Lewis came out on top almost only because Ngannou rarely attempted to engage. That victory moved Lewis to 8-1 in his last nine fights, and he now enjoys a two-fight winning streak after losing to Mark Hunt in 2017. Although Alexander Volkov is one of the most skilled heavyweight fighters on the roster, he seems to get very little of the respect he deserves in this division. Volkov is currently on a six-fight winning streak, and four of those are in the UFC since joining in 2016. Most recently, Volkov secured a win over former champion Fabricio Werdum. Ovince Saint Preux is set to face the rising up-and-comer Dominick Reyes on the main card of UFC 229. “OSP” is a proven veteran of the light heavyweight division and is enjoying a career rejuvenation now after winning four of his last five fights. Before this streak, Saint Preux suffered defeat against Jon Jones, Glover Teixeira, Jimi Manuwa, and Volkan Oezdemir, all of whom are top-rated light heavyweight fighters. And recently, “OSP” has been scoring wins in all kinds of ways against unproven contenders and rising talent. That’s precisely the category in which Dominick Reyes lies right now. Unbeaten after nine fights and with three-first round victories to his name in the UFC, Reyes is storming up the ranks and is demanding attention from fans around the world. His exciting and fast-finishing style has been ultra-impressive, and he’ll be looking to put “OSP” away early in this one. Michelle Waterson and Felice Herrig will open up the UFC 229 main card with an exciting women’s strawweight clash. Waterson is now 3-2 in the UFC with her only losses to current champion Rose Namajunas and the super-tough Tecia Torres. Her win over VanZant is easily her most impressive, as she secured a takedown and submitted her with a rear-naked choke in the first round. Waterson narrowly avoided a three-fight losing streak by winning a closely contested battle with Cortney Casey most recently. Felice Herrig is in a similar position to Michelle Waterson right now. With wins over Cortney Casey, Justine Kish, Alexa Grasso, and Kailin Curran, Herrig has shown she is a class above the middle-tier of the division. However, she was unable to launch herself higher into the rankings recently after losing to Karolina Kowalkiewicz by split decision. This should be a competitive back-and-forth war, but we’re siding with Felice Herrig. UFC 229 begins on UFC Fight Pass from 6:30 pm ET (10:30 pm GMT) on Saturday, October 6.